After clearing a hog farm in Bulacan province of Ebola Reston-infected pigs, local officials recently gathered and dug into finger-licking good, virus-free roasted pigs. The Bulacan provincial government said "it’s fiesta time" in Pandi town after the Bureau of Animal Industry (BAI) finished culling thousands of pigs that were found infected with the potent Ebola Reston virus. After the BAI's announcement of the culling’s completion last Friday, Bulacan Governor Joselito Mendoza prepared several roasted pigs for the members of the province's peace and order council. 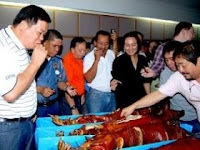 Mendoza, joined by the chief executives of Pandit, Pulilan and Plaridel town, local police officials and health officials, including Dr. Eric Tayag of the National Epidemiology Center, dug into crispy, juicy roasted hogs after the peace and order council. A total of 6,210 infected pigs were slaughtered by the BAI in a week-long culling operation at the Pandi hog farm.